Watch faces for beading make it possible to create a unique yet functional accessory. You can make a beaded watch to update your own wardrobe, create a watch as a gift for someone special, or make watches to sell at a local craft show. There are beaded watch faces available in a wide range of design styles, ranging from slim and elegant watches with a contemporary feel to larger watch faces that are guaranteed to make a strong style statement. Watch faces can use standard numbers, hatch marks, or Roman numerals. If you're making a watch as a gift for an older recipient, however, it's probably a good idea to choose a watch that has numbers which are easy to read. Keep in mind that sterling silver or 14k gold watch faces for beading will be more expensive than base metal watch faces intended for simple costume jewelry projects. If you have your eye on a watch face that is more expensive than your crafting budget allows, remember that most stores have regular sales on jewelry making supplies. At stores such as Hobby Lobby, there are also regular coupons available for a percentage off the item of your choice. When designing a beaded watch, it's helpful to have a bead board available so you can experiment with different design combinations. A bead board is a jewelry making tool that features grooved slots that allow you to experiment with the placement of beads in your project before you start to string your watch together. Take a look through your jewelry box for ideas on which colors and design styles best suit your personal taste. Flipping through fashion magazines is also a good way to get ideas for jewelry making projects. Neutral watches, such as those made with tan, cream, gray, black, or white beads, are sure to coordinate well with a variety of outfits. A monochromatic color scheme, using various hues of the same color, offers a simple way to make an attractive looking watch. Mixing various bead sizes and shapes is a good way to add interest to a monochromatic beaded watch design. If your watch face is gold, consider using warm colors for the bead design. Yellow, orange, brown, and red beads will all complement a gold watch face. If your watch face is silver, consider using color colors for the bead design. Blue, green, purple, and magenta beads will all complement a silver watch face. 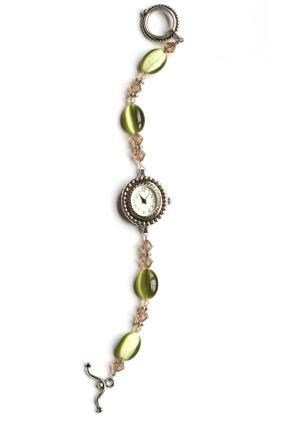 Another way to add interest to a beaded watch is to incorporate charms into your design. You can find charms with hearts and flowers, as well as charms to represent various hobbies and special interests. There are also charms that you can add a small photo to, which will turn a beaded watch into a very unique keepsake for a mother or grandmother.When designing your watch, keep in mind that a beaded watch will generally need to be between seven and nine inches in length in order to fit an adult wrist. A watch made with stretch cord can be a bit smaller than one made with wire links, however.